Zimbabwean nationals marched to the Zimbabwean Consulate in Cape Town on Thursday to deliver a petition calling for President Robert Mugabe to step down. 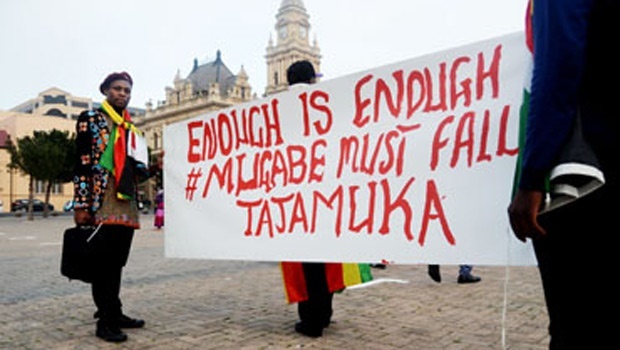 The march was sparked by the ongoing protests in Zimbabwe against Mugabe's government. The southern African country has in recent weeks been hit by a wave of protests, as Zimbabweans demanded that the government act on the ongoing economic hardships. The protesters in Cape Town also protested against the arrest of Pastor Evan Mawarire who has been leading the #ThisFlag movement. Mawarire was arrested on Tuesday, but was released on Wednesday after a court in Harare said that the new charges against him were unconstitutional. Mawarire had initially been charged with inciting public violence. The charges were, however, later changed to more serious ones, in which he was accused of trying to overthrow Mugabe's government. Addressing the crowd before the march, the the group's spokesperson, Lasuet Savadye, called for Mugabe to step down immediately, saying that the southern African country could no longer wait for the 2018 presidential elections. "We will not wait for the Zimbabwe elections in 2018, we want him out now," he said. A few South Africans with placards also joined in solidarity. A Cape Town University student, Qiniso Qiniso Van Damme, told News24 that it was essential for Africans to unite during challenging times. "We are so quick to say 'Black Lives Matter' in America, but we don't want to show support to our fellow Africans," he said. A young Zimbabwean boy, speaking to his friend, was overheard expressing grave concern for the bleak future of his country. "I don't know how we are meant to go home under these conditions," he said. The Zimbabweans danced and sang revolutionary songs as they waited for the petition to be handed over. Reports indicated that the same protests were held in Johannesburg and Pretoria.